September 8, 2016, 2:43 PM · Japanese violinist Mayu Kishima had actually quit doing competitions for good -- when she decided to do just one more. "I've done several competitions, and I'm not a good competitor," Kishima told me last week in the lobby of her hotel in Shanghai. Of course, I was skeptical of her view; just the day before she had won First Prize in the inaugural Shanghai Isaac Stern International Violin Competition. But she said that for her, competitions always were a struggle. "Last year, when I played the (2015) Tchaikovsky Competition, I decided not to do any more competitions," she said. "I'm 29 years old, and I didn't pass to the Finals. In 2009, I was in the Finals at the Queen Elisabeth Competition but didn't receive any prize. I never could play well on stage in a competition -- something was blocked mentally." After the Tchaikovsky, people advised her not to do any more competitions, and she took the advice to heart. But something changed for her in the months following the Tchaikovsky. "After the competition I had a tour in Japan, and I felt so confident," she said. "Playing on the stage in a competition was not a normal state of mind, for me. But getting to the stage to play a concert, all of a sudden I felt so free. Something had improved, something had changed in myself. I thought, maybe I will come (to Shanghai) as a last time, and maybe I will try to do my best on the stage, no matter what prize I get. Even if I don't pass the first round, I want to play the way I want to play, on the competition stage." Something else that might have attracted her to the Shanghai competition was the name Isaac Stern (1920-2001). 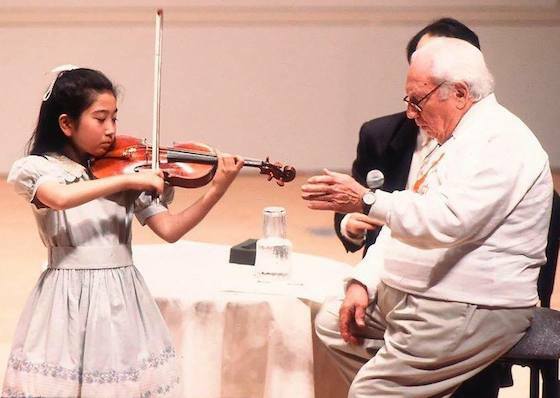 Though it was not in her bio and no one at the competition knew about it, Kishima had met Isaac Stern when she was just nine years old. The young Mayu Kishima in a masterclass with Isaac Stern in the 1990s. Photo by K. Miura, used with permission from the artist. In 1996, just five years before his death, Stern had held masterclasses at his festival in Miyazaki, Japan. Young musicians from all over Japan came to audition for the chance to play for Stern, and Kishima was one of the lucky violinists who won that opportunity. In fact, she participated for three years in a row; Stern made an exception for her to participate more than once. The things Stern told her inspired her to build not just her technique, but her musical life. "Many of us were playing show-off pieces, very technical pieces," she said. "I don't remember if I played a very technical piece, but he asked me if I played all the Mozart sonatas, the Bach -- those basic pieces." After that she decided to go back and re-learn Handel Sonatas and other basic music at the foundation of the violin repertoire. "It was life-changing," she said. Many times, the best students skip straight to the virtuoso works to and immediately start playing concerts. With the focus on impressing people, "we skip too much," she said. If a violinist does not take time to build that foundation, "it will affect you, and you will notice it more and more as you get older." Isaac Stern's three children, Michael, David and Shira Stern were all at the competition last week. "The Stern family was touched at the Gala (after the Shanghai competition) when I told them," Kishima said. "They had not known their father's story with me, but somehow it is all connected now." Born in Kobe, Japan, Kishima started playing the violin when she was three years old. As an only child, "I was spoiled - my parents gave me the chance to study violin, piano, gymnastics, drawing, everything," she said. "But since the beginning, I liked the violin. They didn't think I needed to play as a professional, it was just a hobby." "When was really small, I already knew I would become a violinist," Kishima said. "I don't know why -- nobody told me I was good or anything like that. I was not a wunderkind, a wonder-child. I just loved playing." As a child, her violin-heroes were Jascha Heifetz, and "I was crazy about Anne-Sophie Mutter. And of course Maxim Vengerov." "When I was 11, I thought about going to Juilliard, but somehow the family situation didn't allow me to go," Kishima said. "So I waited two years and I met Professor Bron. That brought me to Germany, to study with him." "Really intense," Kishima said. For example, "my first lesson in Germany was to learn the Glazunov Concerto. Five days after my arrival there was a class concert, and he made me play the Glazunov Concerto, third movement, in five days. And of course you play by memory - it was a crazy time." But at age 13, she was not afraid of the challenge. "In the lesson, Bron is able to see a person's future, and he can plan how to make it happen," Kishima said. "With me it was quite fast. He gave me the plans very quickly, and I had lessons every day when I first started to study with him. He is someone who, in one 45-minute lesson, can make a person improve incredibly. He can also motivate a person to be a better player or to get new ideas. He is amazing with his ideas." Kishima continued to study with Bron at the Hochschule für Musik in Cologne, Germany, where she earned a Bachelor's degree in 2012 and Master's degree in 2015. She also made a number of recordings, playing "Tzigane" on a 2003 recording called Ravel: Orchestral Works; a 2008 album called Chaconne; and Rise from 2016, which includes Faure's Sonata No. 1. When it came to competitions, Kishima did a number of them, but with reluctance. "Actually I was against competitions, very much," she said. "I didn't do a lot of them." Mayu Kishima. Photo © Violinist.com. The Shanghai competition was not her first success: in 2000, Kishima won top honors in the Junior Division of the Wieniawski International Competition; and in 2011 she won First Prize, as well as the David Garrett Award for outstanding musical interpretation, in the International Music Competition Cologne. Kishima had never been to Shanghai until the competition, and she didn't know how she would be received as a Japanese violinist. "There are many things going on in politics between Japan and China, and so I had mixed feelings," she said. "That's why it meant a lot for me to win the prize here, as a Japanese in China." When she arrived for the competition, she could tell that something was different. Drawing lots to see who will go in what order is something that always made her nervous to the point of being sick, "so I never could go to the drawing lots myself," she said. "This time I was sick again, but I went." That is when she heard David Stern speak. Stern, a conductor and member of the jury in Shanghai, is the son of Isaac Stern. "He was telling us what he wanted from the competition, and it was quite amazing," Kishima said. "He was saying that they were not searching for perfection -- many competitions search for the perfect performance. He said he was looking for somebody that he would love to help, love to hear as artist. He said you don't have to worry about perfection. It made me more comfortable, like, I don't need to try to be more perfect than I am!" "It was the first time I'd ever felt glad that I came to a competition, before my playing," she said. That's not to say it was an easy competition; the demands were hefty. "At the Queen Elisabeth, there was one week of being in a closed place and you are not able to reach anybody, no cell phones, no T.V., no radio, and you have to learn a new piece. I thought it was quite a lot," Kishima said. "But this competition was even more because you had to prepare two Ysaye sonatas; at the end you had to play just one. In nearly everything, we had to prepare more than we played. Also the chamber music; the rehearsal time was only 30 minutes, so we got two times to run it through, and that's it. Then with the pianist, only a small amount of rehearsal. So basically you are trying it out on the stage. Either you take a risk, or you are playing it FOR the competition -- trying to play it in the safest way possible. I took many risks." She also had to do some new things, like write her own cadenzas for Mozart Concerto No. 3. "I had never tried to compose myself," Kishima said. "I didn't know how to start. I came up with some passages, but I didn't know how to turn it into a cadenza. I started to play, and then I continued, continued, added, added, then I rotated some things. The writing was the last thing." Kishima, who plays the 1700 "Petri" Strad (on loan from Dr. Ryuji Ueno) said that while she practiced hard for this competition, she does not practice six or seven hours a day. In fact, "some days I don't practice," she said. "When I was small, yes, maybe I practiced a lot. But after my 20s, I started to spend a little time away from the violin." "I developed friendships with people who were not musicians, and I was very much influenced by my other friends," she said. "If you are a musician, you always hang out with musicians. You don't meet people who aren't musicians when you study at University. So I went to Paris and I met many other people. "I started to see the big picture, I started to see music from other side," she said. "When I was younger and when I only had musician friends, I was focussed on technical things, or other elements of the pieces likes fingerings or mistakes. You forget that no matter what happens, you just have to enjoy the music, to feel what this person is doing." "When you start to know the view of non-musicians -- they are really feeling the music," Kishima said. "I learned a lot from them, and it changed a lot for me." Shostakovich, Violin Concerto No. 1 in A minor, Op. 77 with the Shanghai Symphony at the Finals of the Shanghai Isaac Stern International Violin Competition 2016. September 9, 2016 at 01:02 AM · Thank you for this inspiring interview! September 9, 2016 at 04:16 PM · Laurie, I've really enjoyed and appreciated your coverage of this event I almost feel like I was there and what an amazing story Mayu Kishima has to tell with her words and with her violin! September 9, 2016 at 05:52 PM · It is refreshing to read about a violinist who is driven not by technical perfection but by the music itself. That was an illuminatnig interview. Thanks, Laurie. September 9, 2016 at 09:59 PM · Excellent article, as always, Laurie. September 14, 2016 at 07:45 PM · Thanks for this excellent article, Laurie! In Not by Love Alone, Mayu Kishima only get a short mention (I didn't even attempt to cover her generation fully): appropriately enough as "competition winner. Now I realize that this is probably not the label she herself would prefer. If I ever publish an updated edition I'll have to make a point of doing her more justice.